La Guajira peninsula is, on the surface, a barren and inhospitable desert perched on the northernmost point in Colombia. On closer inspection however you will find a place full of life, incredible views, with a history of smuggling, pirates and a proud Wayuu tribe who never succumbed to Spanish subjugation. Tours: La Guajira and the Wayuu There are no products in this category. 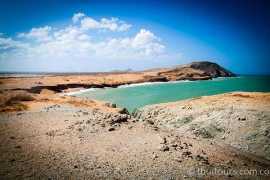 Full of contrasts between the sun, sea, sand, and salt, La Guajira is a stunning off the beaten track place to visit.